HERMITAGE – A lot of planning went into the youth conference that took place at First Baptist Church, here, March 15-17. With more than 500 students and adults from multiple churches registered, the speakers had to be lined up, activities planned, worship scheduled, breakouts sorted, and accommodations booked. One thing organizers didn’t have to worry about was how those students would be fed. Matt Coley took care of that. Coley, a member of Mt. Pleasant Baptist Church in California, travels the state with three propane cooktops wherever he’s invited. If the church will provide the food, he’ll do all the cooking. For the Hermitage Youth Conference, he began cooking 8 hours before anyone arrived. By Sunday afternoon, he’d prepared 230 cheeseburgers, 30 lbs. of hot dogs, 1,000 pancakes, 80 lbs. 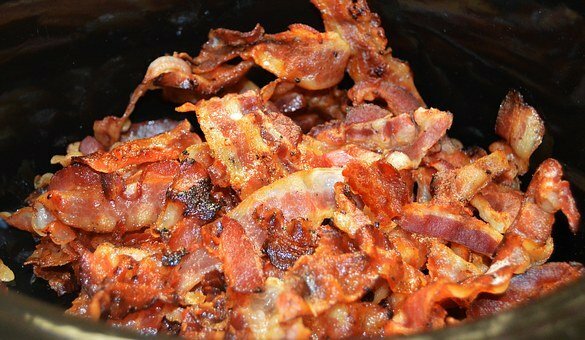 bacon, and 80 lbs. of tortillas. Coley sees it as a labor of love. In 2011, the electrician for the State of Missouri saw area churches unable to safely and efficiently prep meals for large events, so he decided to take on the challenge. He bought a used 48-inch gas griddle and modified it so that he could easily load it into a trailer and set up shop outside wherever God led him. The next year, he found that the set up reduced time spent cooking and enabled others to go about their ministry, so he bought another 48-inch griddle. 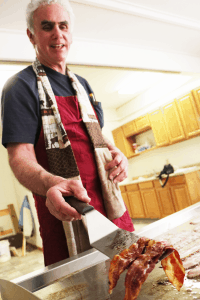 He began volunteering to cook for events like First Baptist’s annual youth conference, and was soon hauling his griddles to various buildings and missions projects around the state. “I like to keep a simple menu: pancakes, bacon, sausage, fried eggs, charbroiled or fried burgers, hotdogs, corndogs, and French fries,” he said. To contact Coley about cooking for a church event, email him at mattco58@yahoo.com or call or text him at 660-888-9245. The minimum group size is 30 people.